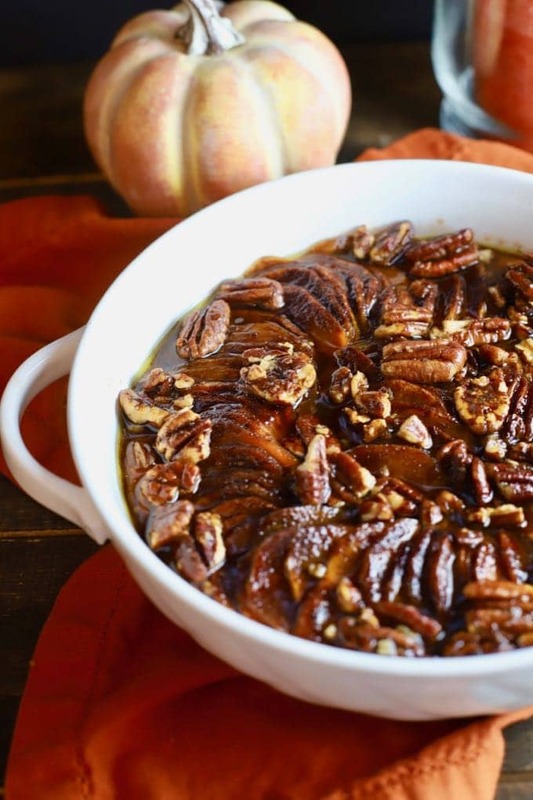 Easy Baked Southern Candied Sweet Potato casserole features thinly sliced sweet potatoes, covered with brown sugar, cinnamon, nutmeg, and ground cloves, and then topped with sweet creamy butter and candied pecans. This easy classic Thanksgiving and Christmas casserole recipe comes together quickly and is both decadent and delicious! 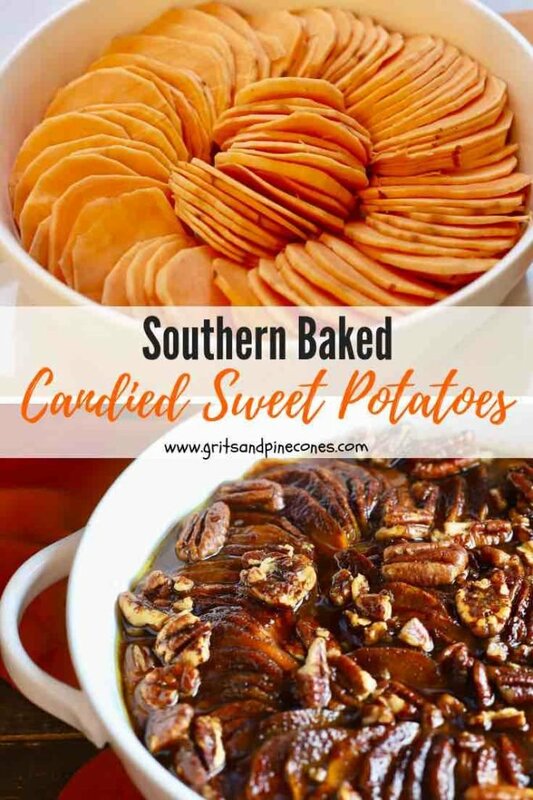 Side dishes rule at holiday dinners and luscious Baked Southern Candied Sweet Potatoe casserole with brown sugar and pecans is an outstanding choice with its warm aromatic spices and caramelized sweet potatoes. 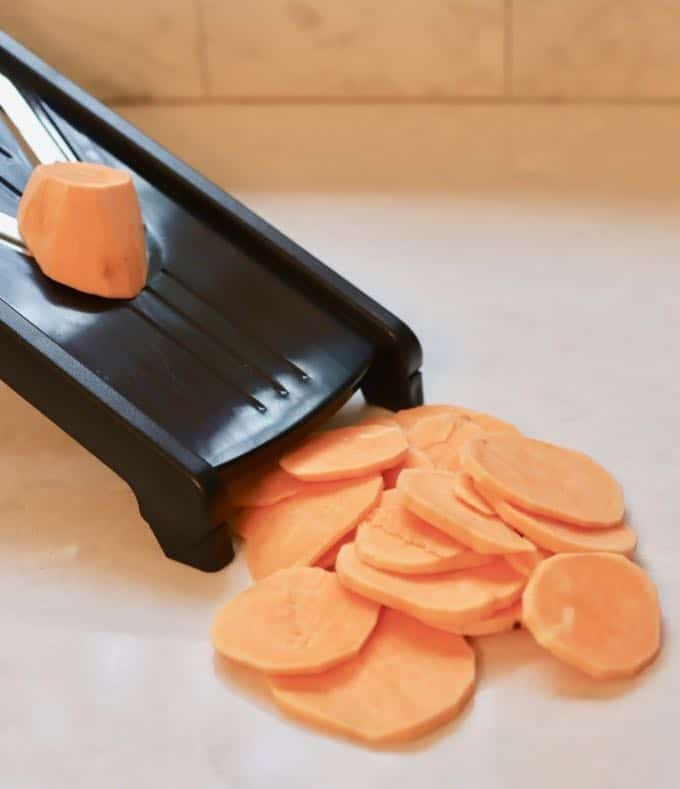 A mandoline or food processor with a slicing blade makes short work out of slicing the sweet potatoes, but if you don’t have either one, you can certainly slice them with a sharp knife. Thicker slices will just mean this scrumptious holiday casserole will take a little longer to cook. 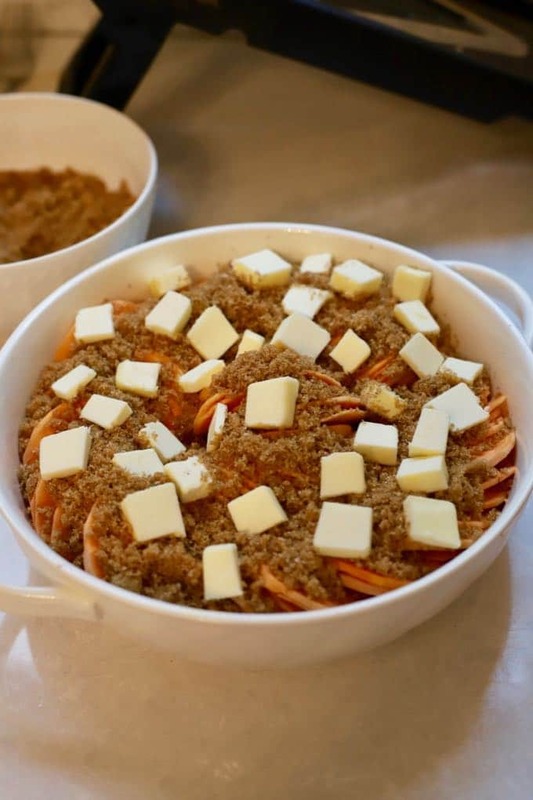 Looking for inspiration for other holiday side dishes? Use a mandolin, a food processor with a slicing blade, or sharp knife to slice the sweet potatoes as thin as possible, 1/8 of an inch or less. Spray a 9-inch round baking dish with sides at least 2 1/2 to 3 inches high, lightly with non-stick cooking spray. 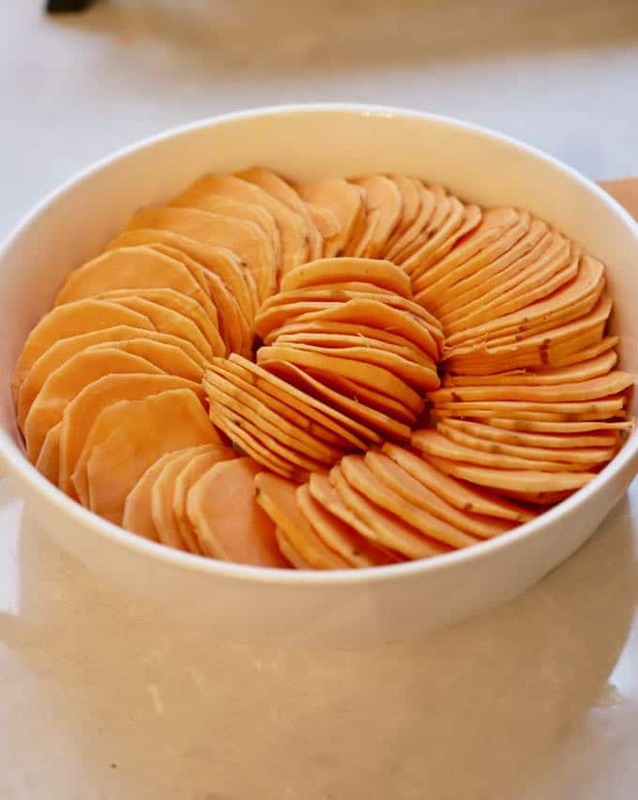 Place the sweet potato slices around the dish in a circular pattern. Set aside. Mix the brown sugar, cinnamon, nutmeg, salt, and cloves in a small bowl and sprinkle it evenly over the sweet potato slices. Top evenly with the cubes of butter. Cover the dish with either aluminum foil or a lid and bake for 75 minutes. Remove the casserole from the oven and remove the foil or lid. Sprinkle the pecans evenly over the top and bake for an additional 10 minutes. For the most uniform sweet potato slices, try to choose potatoes that are approximately the same size in diameter and length. Longer potatoes which are about 3-inches or less in diameter work better than shorter, fatter potatoes. If your potato slices are thicker than 1/8 of an inch, they will take longer to cook. 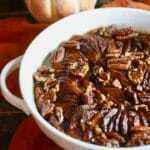 You can use purchased candied pecans, or check out my recipe for Quick and Easy Stovetop Candied Pecans here. You can also substitute toasted pecans for the candied pecans. 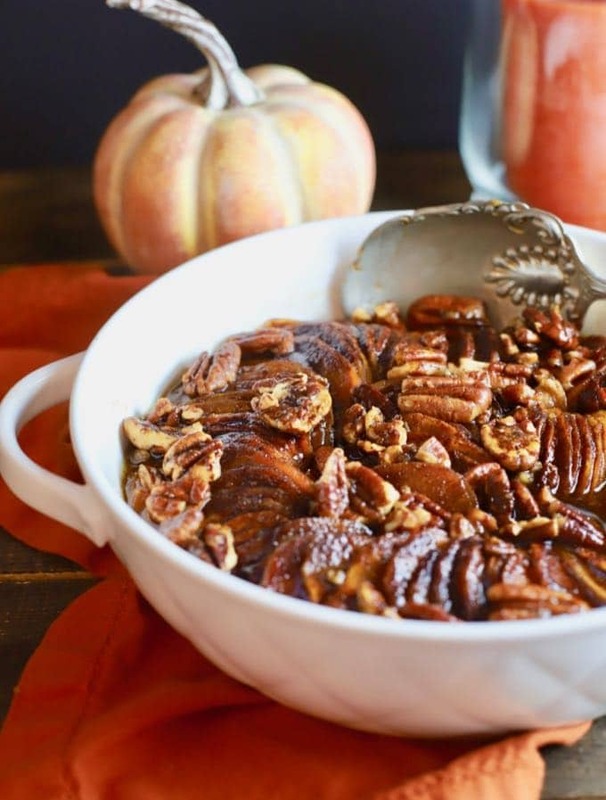 Easy Baked Southern Candied Sweet Potato casserole features thinly sliced sweet potatoes, covered with brown sugar, cinnamon, nutmeg, and ground cloves, and topped with sweet creamy butter and candied pecans. This easy classic Thanksgiving and Christmas casserole recipe comes together quickly and is both decadent and delicious! A mandoline is one of my favorite gadgets in the kitchen. And I love how beautiful the sweet potatoes come out for this recipe. And candied sweet potatoes are the perfect dish for Thanksgiving. So crazy that we are already a couple weeks from Thanksgiving. Where did time go?? Can you make this dish a day before ? Yes, but I would go ahead and bake it to keep the raw sweet potatoes from turning brown, and then just reheat on Thanksgiving. I hope you enjoy it!